But before we get to the recipe, I'm going to tell you a little story. Back in 2010, I moved to San Francisco a few months after graduating from college. I was beyond excited -- my first real job with a salary and benefits, and I was going to be living in one of the world's most beloved cities. What could go wrong? Well, it turns out a lot of things. Especially with a paltry entry-level salary barely above $35K and a steep rent of $1,395 for the only apartment I could get (which of course, happened to be in a sketchy, gang-ridden part of town). Every day was a meticulous game of counting pennies to make sure I could make next month's rent. So while the rest of the city boomed from the high-tech gold rush, I was quickly left out and became one of those struggling Lena Dunham-type characters slaving to make their way in a city that didn't even really want them. So what was it like to be a such a big eater and live in San Francisco, a bastion of foodie culture and one of the leaders of the country's burgeoning Food Revolution? Quite frankly, I can't tell you because all the great places were so laughably out of my meager budget. For a long time, I couldn't even bear to look at these restaurants' menus. It seemed like everything I loved and was interested in was right there happening around the city -- but it was all just so completely inaccessible to me. But then I discovered Mission Chinese Food. Cheap, dirty, and delicious with generous servings, Mission Chinese was a pop-up that operated for a few days a week inside another restaurant. I quickly made it a weekly routine to eat at the restaurant, with friends or even without them. Danny, the hipster chef with the badly-dyed bleached hair, quickly took notice of my desperate regular presence while he was out front pulling noodles and rolling dumplings. He began to slip me free appetizers and samples here and there, always stopping by my table for a quick chat. As the months went by and article after article got written about the place, I began to see my beloved hole-in-the-wall grow. My favorite items on the menu -- the three-spice garlic eggplant, the Szechuan beef cheek -- were rotated out. I began to feel uncomfortable eating there on my own, as tables began to fill up and lines began to grow out the door. Soon, I considered myself lucky if I only waited 45 minutes for a table. Kind of insane, considering it was a restaurant with bars on the windows and a paper dragon with PBR cans in its mouth for decoration. I did go back to Mission Chinese one last time before I left San Francisco though. Although it had been months since I'd last been able to get a table within a reasonable time frame, Danny instantly recognized me, waved, and zoomed over to the table with some free Szechuan pickles and peanuts. He gave me a grin and winked, bustling away to the kitchen without another word. That was the last time I saw him in person. The next time I saw him, he was on The Martha Stewart Show. First of all, they're HUGE -- like two brownies stacked on top of each other. That's why I've fondly dubbed them as "bricks". The sour cream (originally creme fraiche, but I swapped it out with sour cream to make it more accessible) gives a surprising, but entirely welcome "pizzaz" to the classic brownie flavor. Appropriate, since almost all of Mission Chinese's dishes could be described that way -- Americanized Chinese food with an unexpected, yet delicious twist. Preheat the oven to 350 (F). Butter a 9" x 13" baking pan and dust it with cocoa, making sure to shake out the excess cocoa. Set aside. Melt 10 1/2 oz. chocolate and 14 oz. butter in a double boiler, making sure to stir constantly so the chocolate doesn't burn. Set aside to cool slightly. Use a freestanding electric mixer with a whisk attachment (or use a handheld electric whisk) to whisk 7 eggs with 2/3 cup sour cream, 2 3/4 cups sugar, and 3 1/2 teaspoons vanilla. Whisk for at least 5 minutes until you get a nice, light, airy mixture. When your egg mixture is nice and airy, add the chocolate/butter mixture from the first step and use a rubber spatula to mix together until just combined. In a large mixing bowl, sift and mix 1 2/3 cups flour, 1/3 cup cocoa powder, and 1 1/4 salt. Use a measuring cup to form a deep well in the center. You should be able to see the bottom of the bowl. Pour the wet ingredients (your egg/chocolate/butter mixture from step 3) into the well in the center of the dry ingredients. Use a rubber spatula to gradually incorporate all of the dry ingredients, mixing as little as possible. 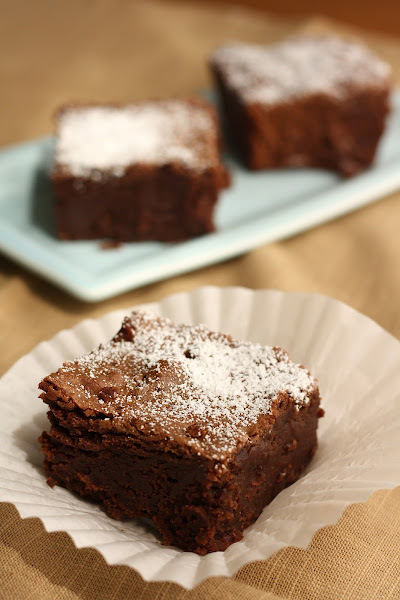 Be careful not to overmix the batter, or you will have tough brownies and I will cry for you! Just keep mixing until you see one or two flour streaks in the batter, then stop. Fill the cocoa-dusted pan with the brownie batter, and sprinkle the entire surface evenly with big pinches of granulated sugar. Bake for 24 - 30 minutes. Check for doneness every few minutes thereafter, being careful not to overcook. 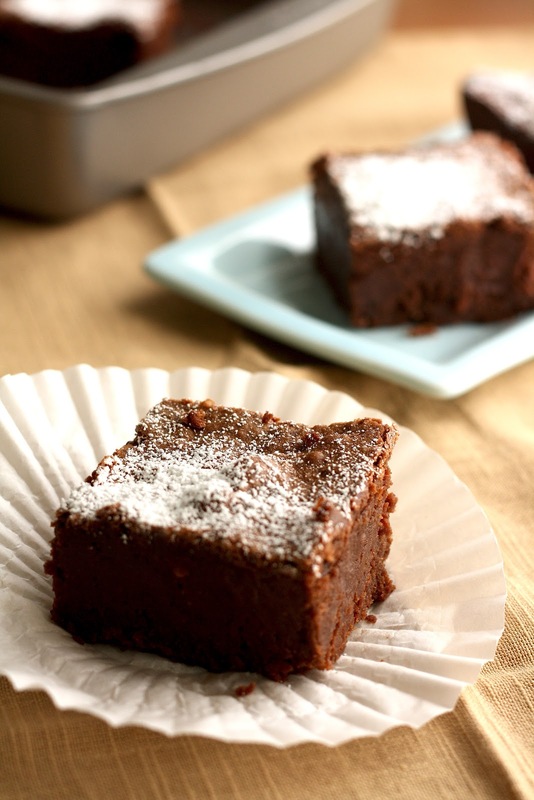 The goal is for the middle to be a bit fudgy, so if you insert a toothpick into the brownies, it should come out a little dirty, but not with any liquid batter on it. Cool on a wire rack completely before slicing into squares. 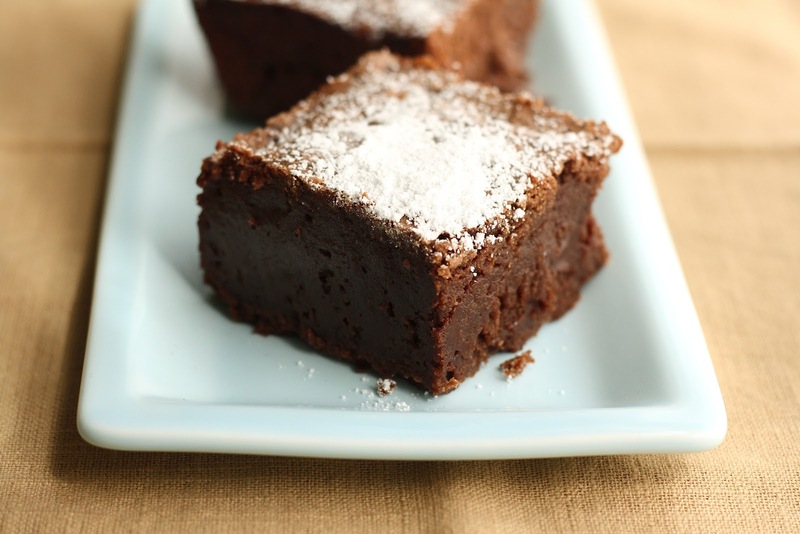 These brownie bricks look super duper delicious! These are easily the most delicious brownies I have ever made in my life. I substituted (1-for-1 equal measurements) a gluten free flour mix plus arrowroot powder, and coconut palm sugar for the flour and sugar, and made a cream cheese mixture for the top. Seriously incredible... Very impressed with this recipe, especially considering I couldn't tell I had used substitutions. THANK YOU!! Hi Cebon, Thanks for posting your gluten-free adjustments on here. I'm always in awe of folks who can do that -- I'm also excited to hear that these brownies turned out great with your alterations! I'm tempted to try your alterations for myself! is the sugar normal sugar or castar sugar? Normal sugar, but caster sugar could work too.